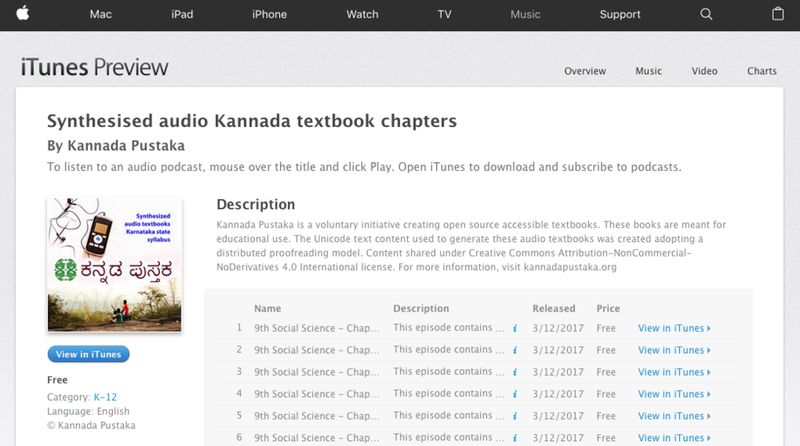 Audio synthesized textbook chapters were sent out to all schools across Karnataka and there we thought we did something historic! It was definitely true but thinking of the reach, we do not know if the CDs that we sent to schools were actually used. We tracked the delivery, chased up the receipt acknowledgment with the schools individually and we have updated this information open on our website homepage. Despite these efforts, we have no sense of who used it, what was good what is popular and so on. Further, if we come up with a cleaner (text or voice) version, we donot have a way to sort of have version control. The way out and solution was to create a Podcast channel with these synthesized textbook chapters. An event organized by Department of Kannada and Culture, Government of Karnataka pushed us to bring the audio conversion and curate the synthesized audio files to a completion. It was then we thought it is better to host them on a podcast channel. We had not thought of this and we weren't aware of the technicalities and it was a learning curve albeit an easy one. It was pretty easy to upload these files on our web page as blog posts and 100 odd chapters were uploaded in a matter of few days. Once the system was in place, our volunteers completed the painstaking work of uploading these individual chapters as episodes. This wasn't easy but happened right on time. Right now, we have all our outputs uploaded on our iTunes channel and this is just the beginning. There were apprehensions initially on the accessibility of the podcast on non-iOS platforms. Android is the natural and most common choice of smartphones. 1) playback speed: Episodes can be played at speeds above or below the normal playback speed and this is advantageous for students with different speed preference. 2) chapter mark: chapter marks provide placeholders in a given episode. This means if the paragraphs and key components are 'chapter marked' students can skip through and scan through a podcast episode seamlessly - literally like flipping the pages of a book! We tested this thoroughly and we were convinced PodcastRepublic can not just serve as an alternative but is actually better and advantageous to deliver audio files to visually challenged students. Other advantages of having these episodes online are instant access and version control. Anyone with a smartphone can download PodcastRepublic and play these episodes, download them for offline playback and the interface provides an easy way to look for chapter and content within chapters. Note keeping: The culture of notes keeping goes back in time from hand written to iOS Notes to Google Keep. PodcastRepublic chapter marks provide this fundamental intuitive yet ignored technique to visually challenged. With chapter marks, playback speed and easy access to the audio files, podcast looks like the most intuitive option to deliver audio content to students.